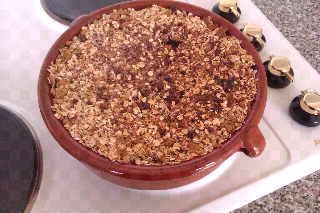 This is the Crumble that Mum made today,a fruit crumble. Peel and chop the pears and apples and pop in to a sauce pan add some water (enough to simmer in),the mixed spice or cinnamon,the vanilla essence and the 5 teaspoons of sugar,bring to the boil then reduce heat to simmer for about 30 Min's then reduce the mixture down to thicken or add a thickening agent to speed up process,pop the mixture into an oven dish.Crush the biscuits(cookies-Plain type no added extras in them like chocolate) then add the porridge oats and mix together adding a little bit of brown sugar to the mix,do enough to cover the fruit mixture about a cm deep then cook in the oven for about 45 Min's at 175centigrade.Serve with Vanilla custard. 1:Simply Beautiful on Amazon.com they sell Birds Custard powder in 300g and 600g sizes. 2:The English Tea Store at htpp://www.englishteastore.com they Birds custard powder in 300g size. 3:British Food Shop at htpp/www.britishfoodshop.com they sell both sizes of Birds custard powder and Ambrosia Devon Custard ready made in a tin thats made in my neck of the woods. the other option is to find an English or Irish store locally.Happy Hunting! Oh I'll bet that smells soooooooo good! *licks lips* That sounds really really delicious! Oh and it met with Dad's approval too! Why not just go ahead and UPS that over here so we can see and taste it in person! We'll share - honest! Oh, oh, oh. What a start to my blog reading today! Frist RG, now Speedy's mum. Gosh, you baking folk are making us food carbonizers hungry. well it was just to good not to share it with everyone! Save some for me!!! I will be right over!!!!!!!!!!!! come one then,I still have some to go around! Are those the English "biscuits" as in cookies---and if so, what kind do you think works best for the recipe--or are they American biscuits which are more like bread?